There are plenty of buildings across the UK which lie empty, yet have the potential to be something spectacular. Adapting and reusing them is a great way to bring them back into use, and avoid costly and upsetting demolition. Sustainability is the name of the game, and repurposing buildings which would have otherwise fallen into disuse cuts down on urban sprawl. Modern technology and developments can also make these buildings environmentally-friendly, and have a positive impact. Here are 15 of our favourite examples of repurposed buildings across the UK which have been brought back into use by innovative developers. Perhaps one of the zaniest creations on our list, Attendant used to be an underground toilet block, installed in Victorian times. 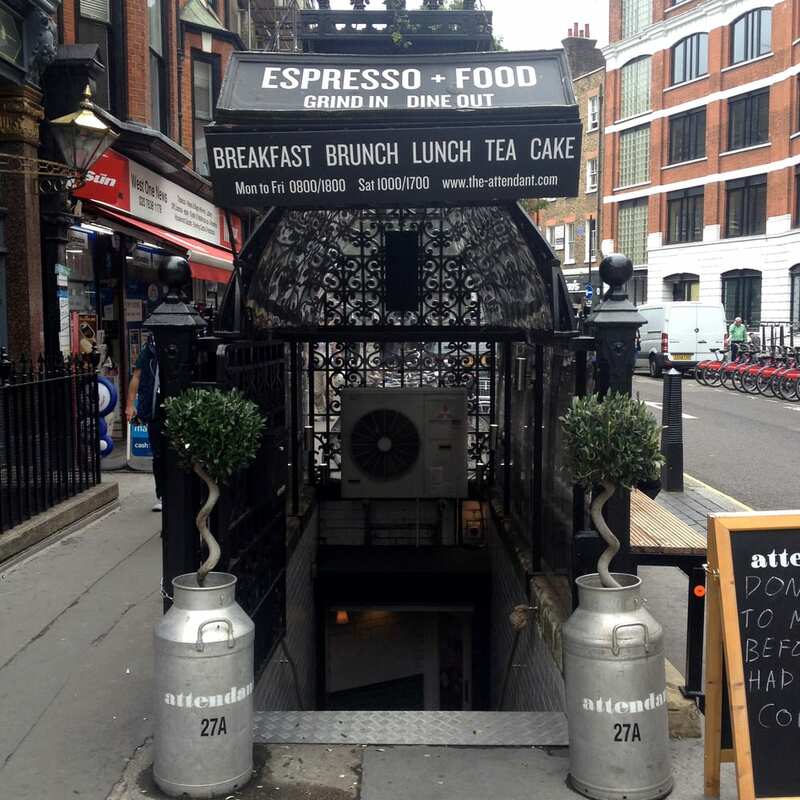 It was originally constructed in 1890, but after remaining closed for 50 years, was brought back to life as a quirky coffee bar. Coffee drinkers can still see plenty of evidence of its former life, such as tables made of the old urinals. A common sight in the past, the floating gas towers with their vertical metal struts were practical, but not pretty. Technology has now made gas holders largely redundant, and while many of them are being demolished, their industrial looks have made them a popular target for architects looking for something unusual. Bell Philips Architects transformed an old gas holder in Kings Cross into a public park, with planting and hard landscaping. One lucky home owner moved into the former waterworks building in Bridgnorth, Shropshire. Double height ceilings, a mezzanine gallery, and porthole windows point to the history of the building. This unique home has a riverside garden, and private jetty, as well as a contemporary kitchen and interior design. Bodmin Jail is nearly 240 years old, but it has sat empty for the last 60 years, and been home to nothing more than a family of bats. London based architects Twelve Architects are transforming the grade 2 listed building into a glass roofed hotel, changing the 63 cells into high end hotel rooms, with an opening date pencilled in for 2019. The original purpose hasn’t been ignored either, with a spooky “Dark Walk” visitor experience explaining the stories of the inmates, and artwork in each room reflecting prisoner experiences. In 1895, Charles Rennie Mackintosh designed a building which was later known as “The Lighthouse” due to its lighthouse tower shape. The building was used as printing offices by local paper The Glasgow Herald, until the early 1980s. With all traces of its printing history removed, it’s now the home of Scotland’s Centre for Design and Architecture, providing office and exhibition space for people working in the creative industries. Offering stunning views over Glasgow from its spiral staircase, this architectural gem was featured on a special edition Scottish £20 note in 1999. The Soho House chain of private members clubs is perhaps best known for Soho Farmhouse, a converted farmhouse which is now a popular celeb hangout for the likes of the Beckhams and Meghan Markle. 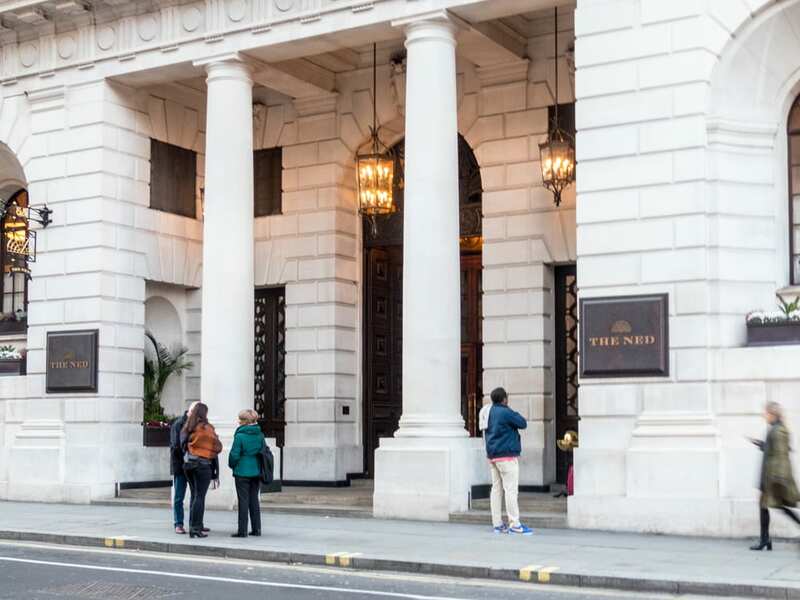 They’ve now moved into London, taking on the old Midland Bank HQ and converting it into The Ned. The building was originally constructed in 1924, by architect Edward “Ned” Lutyens. Its conversion respects many of these banking features. Visitors can head down to the cocktail bar in old vaults, complete with the reinforced 20 tonne door, and nearly 4000 safe deposit boxes. Leith is in the port district of Edinburgh, and has long been popular with creative people and businesses. When this former whisky bond warehouse came to the attention of chef Tom Kitchin, he recognised it as a rare find. Only six ports were allowed to store whisky during the 19th Century, and of the 100 original warehouses, the number had greatly diminished over the years. The Kitchin was converted during the large scale redevelopment known as “The Shore”. An active military flying base until 1976, RAF Bicester is now a civilian aerodrome and military training base. Many of its buildings became redundant, including the old 1930s hangars and control tower, which had listed status. One of these was the old electrical substation, which was converted into a three bedroom house. The conversion respected the art deco style, and the glass atrium on the top floor was a real selling point. It was marketed for £525,000 in 2015, and is currently on the market for £585,000. Other conversions on the same site were a WW2 decontamination bunker, and the old ambulance station. 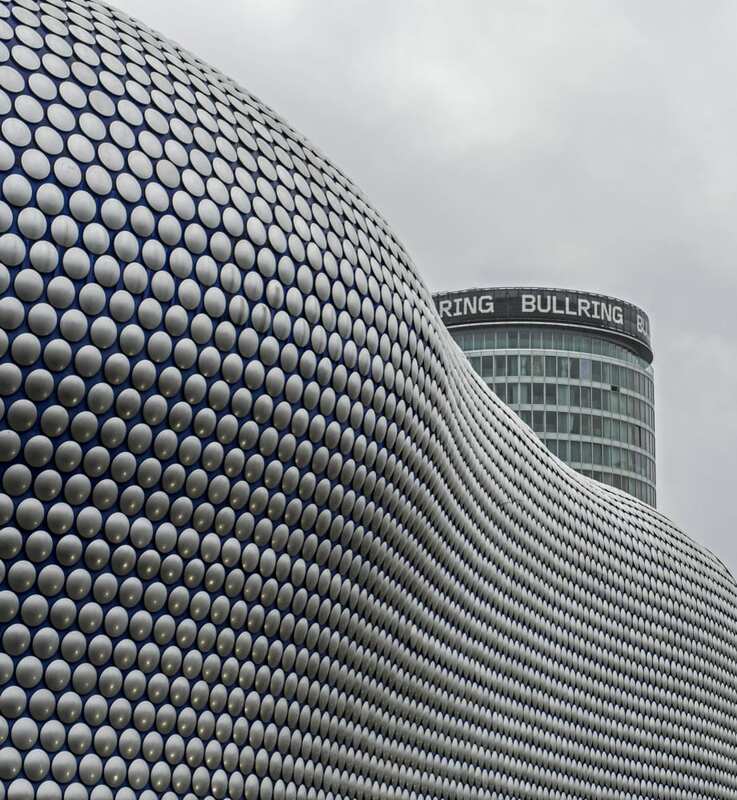 When Birmingham’s iconic The Bullring shopping centre was constructed in 1961, it included a 12 storey office block, but high interest meant this was eventually upgraded to a 25 storey office block. Partial conversion into residential accommodation began in 2004, when a need for more accommodation in the city was noted. 232 apartments were created from what was once office space. The 19th and 20th floors became serviced apartments, targeted at business visitors and travellers. Anyone who’s been to the Lake District at peak time can tell you how busy it is, and how expensive purchasing property there can be. Affordable housing for locals seemed to be a pipe dream, until the Keswick Community Housing Trust came up with a plan. They purchased an old toilet block for £1 from Allerdale Council, and converted it into four one bedroom homes. Another fine Victorian building which has been adapted and brought back into use, the Arnolfini began its life as a storage warehouse. With Bristol being a hotbed for imports, tea, iron and many other imported goods were brought here from the nearby maritime base. 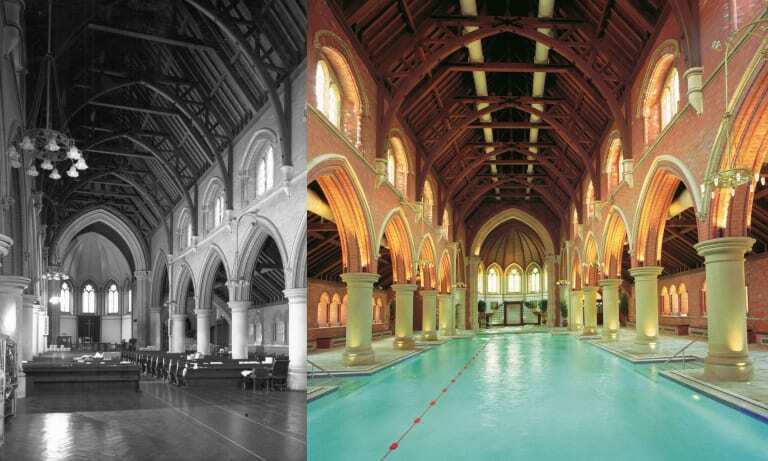 In 1975, it was recognised as an example of Bristol Byzantine, a local architectural style which was popular in the 1850s, and despite strict regulations which came with its grade 2 listed status, it was transformed into a light and airy public art gallery. The canal side triplet of gas holders in Kings Cross have been transformed into 144 flats, with the structure based around the original shape of the gas holders themselves. The original steel work is being restored before being put back into position, before the three blocks are erected with their own rooftop gardens. Each block will be at a different height, as a nod to their previous use by architects Wilkinson Eyre. One repurposed building which is sure to raise a few eyebrows is the conversion of an old psychiatric hospital. London’s Repton Park, in the borough of Redbridge, is the estate built on Claybury Hospital, which was the fifth London County Council Asylum. The asylum is long gone, but 20 years ago, the new development sprung up in its place, with many of the original buildings preserved and repurposed. The gym was once the hospital’s chapel, and many features remain. Hit the treadmill under the barrel vaulted ceiling, or confess your sins in the old confessional, which is now a sauna. It’s certainly a unique experience. Back in 1820, this building was a Victorian cotton mill, and a prime example of the textile industries Leeds was so well known for. However, times changed, and the building was left derelict in the 1960s until its 2003 conversion as part of the Fearn’s Island Mills redevelopment. A new seven storey building was constructed to join two existing historic structures, providing a mix of living and working spaces. http://www.pecketwellmill.co.uk Between Halifax and Burnley, the 19th Century Pecket Well Mill and its associated weaving sheds were converted into houses and three storeys of apartments in 2005. During the conversion, the developers discovered a time capsule, which contained one bottle of local Halifax Pale Ale, and two adult novels. The owner offered to leave their own time capsule in its place, with a bottle of a Bacardi Breezer and a copy of Heat magazine. Another old mill which received the repurposing treatment was Titanic Mill. It was originally known as Lowestwood Mill, but as it was constructed in the same year as the infamous Titanic, it gained itself the nickname Titanic Mill, which stuck. Thankfully, it didn’t sink, and was repurposed in 2003, providing 150 apartments. With a gym and spa on site, along with a healthy eating bistro and retail space, it’s been a popular choice from the outset, with many residents paying to reserve their space two and a half years before it opened. Alsecco offer a number of ways to give buildings the finish which will help them stand out from the crowd. We hope you find our ideas as inspirational as many of these repurposed projects.